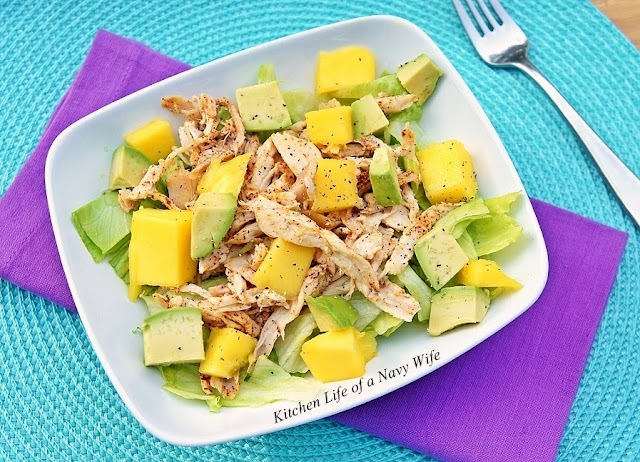 This incredible spring weather we are having deserves an incredible spring salad, so here is a delicious option from “Kitchen Life of a Navy Wife”. If you are looking for salad dressing options, try this: use an old spice jar with a plastic lid that seals and fill it 1 Tbsp of your favorite vinegar (I use champagne vinegar), 1 tbsp Dijon Mustard, 2 Tbsps Olive oil or Avocado Oil, 1/4 tsp Herbes d’Provence, and a pinch of salt and pepper. This dressing is great for taking to work for lunches as well! 1. Place chopped lettuce in a large bowl. 2. Place shredded chicken in a medium bowl and add a TINY bit of water to it (just to moisten it a bit). Microwave for 12-15 seconds. Mix in the chili powder and the cumin. 3. 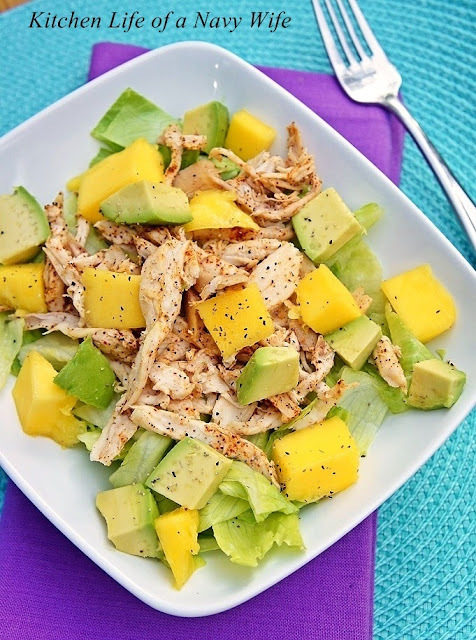 Add the chicken to the lettuce and top with diced mango and avocado. 4. Eat as-is, or top with a light dressing of choice!